According to a new study by Dr. Sander Goossens and his team of researchers at the NASA Goddard Space Flight Center, the crust of the planet Mars is actually porous (imagine a sponge) as opposed to a dense surface (which was previously thought to be the case). In past research, the density of Mar's crust was considered to be around 2,900 KG/m3 (ex. Earth's oceanic crust) but with the new research, it comes in lower at around 2,582 kg/m3 (ex. lunar crust). “The crust is the end-result of everything that happened during a planet’s history, so a lower density could have important implications about Mars’ formation and evolution,” Dr. Goossens said hinting on the future importance of the data. This new value was calculated using Mar's gravity field (satellite tracking data) and applying it to a modern constraint (accounts in Mar's topography) to procure a new solution or value. Old methods relied strongly on rock composition which was not as accurate. 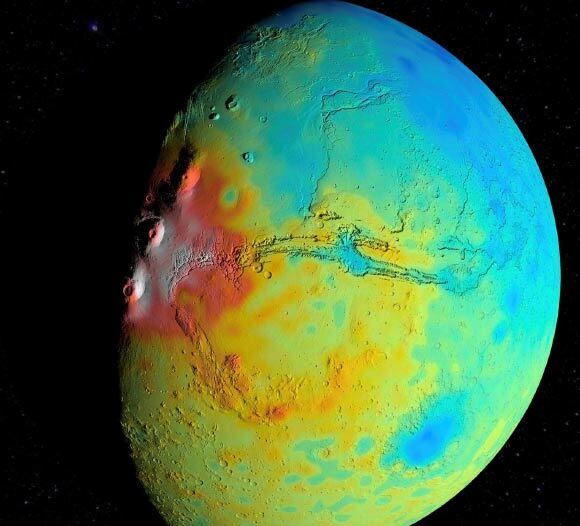 With the modern constraint, a more updated model of Mars has been created with crust density/thickness as well as its giant volcanoes to guide and aid scientists in learning more about the Red Planet.